Spring gardening can seem daunting and overwhelming if we let it. 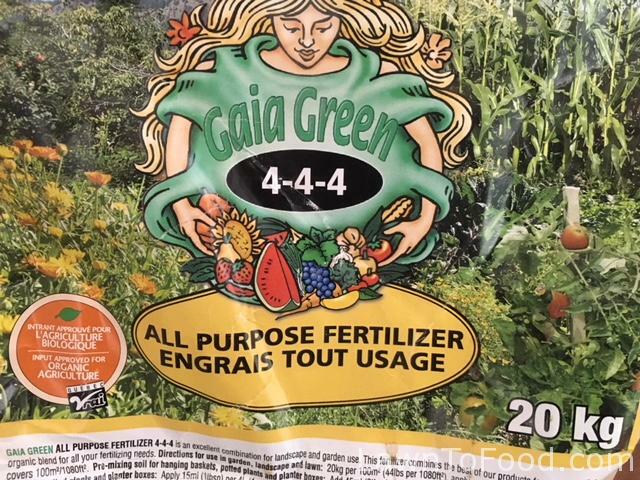 I’d like to share a few ideas for all of us to KEEP CALM AND PLANT ON so that we can simply enjoy the process instead of adding it to the ugg-chore list. For starters, decide how much time you can schedule for preparing, tending and planting your garden this season. That will determine the amount of gardening space you can reasonably handle. For example, I have a lot of other things going on but I know I can commit to 1 1/2 hours on Sundays, Tuesdays and Thursdays. Some weeks I might do more, but I won’t do less than 4 1/2 hours per week (except when on vacation). Knowing that I only have to do 1 1/2 hours increments keeps me in good spirits because it’s very attainable without neglecting any of my other aspirations or duties. On this day, I selected one 4″ by 12″ plot to focus on. It’s early spring, the soil is still quite wet and weeds are popping up. Some new wood chip mulch has already been added to the pathways so the plot needs a bit of redefining. Most of the amendments that we’ve added over the winter (alpaca poo, tomato skins from canning, grass clippings, maple leaves, dog hair, shredded paper with plant based inks, wood ash from our fireplace) have composted in place nicely and will only need a slight tidy before planting. This plot grew Chillies and Peppers last year and Beans and Corn the year before that. I’m not perfect with crop rotations because I do so much inter-planting but I do my best to move plant families around. Hence this year, I’ll be planting sweet Walla Walla onions and assorted Kales in this plot. I purchased one bundle of 50 onion starts for around $4 at Top Shelf Feeds and a 6 pack of Outrageous Kale from the local grocery store. Buying seedlings and starters is a quick and easy way to get a jump start on the season, without spending hours tending to your own seed starts. I do a bit of both, I start some special seed varieties and purchase others. 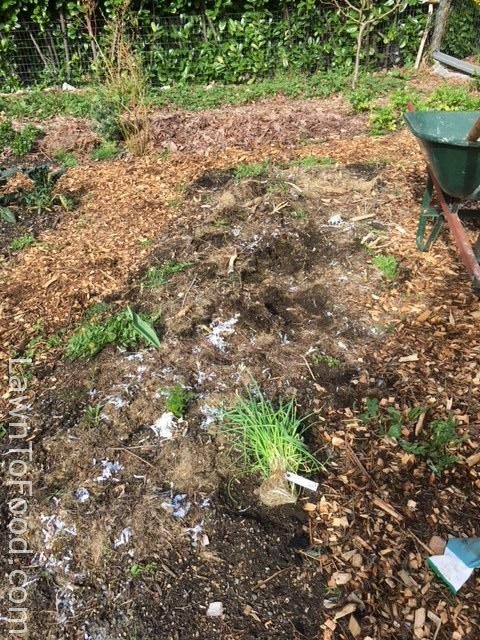 I started by digging out the weeds and picking out any large chunks of material that didn’t completely compost over the winter. Those odds and ends went into my wheelbarrow and then eventually into our backyard’s large compost heap for further composting. 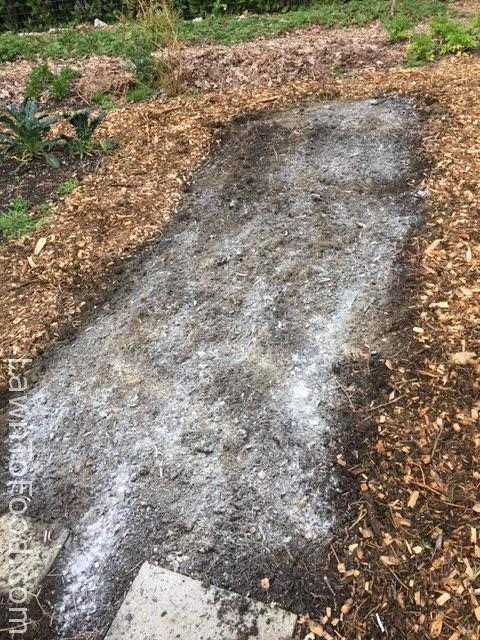 I gave the plot a light raking and then added both a certified organic powdered fertilizer and a dusting of lime because our soil tends to be acidic. You can get organic Gaia Green produces at most Farm & Feed Stores or local nurseries. I gave the top of the soil another light raking, not letting the tines go down more than an inch or two. I never turn over my seasoned soil, or aggressively disturb it with a fork, so to that the organic structures can stay in place (and to save my back 😉 ) Roots from previous seasons crops are still in the soil, sequestering carbon, decomposing and providing oxygen airways. Plus the red wigglers and earth worms are doing an excellent job of tilling. I took my bundle of onions and roughly divided it into 3 sections. I like to plant in blocks so that I can interplant other crops, then they can benefit from each other. 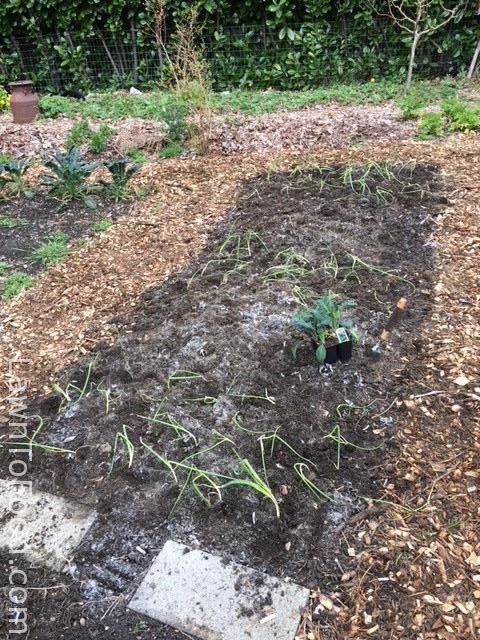 It’s been my experience that onion/garlic/leeks help to discourage harmful insects from attacking the brassicas family ~ cabbage/kale/broccoli/cauliflower. 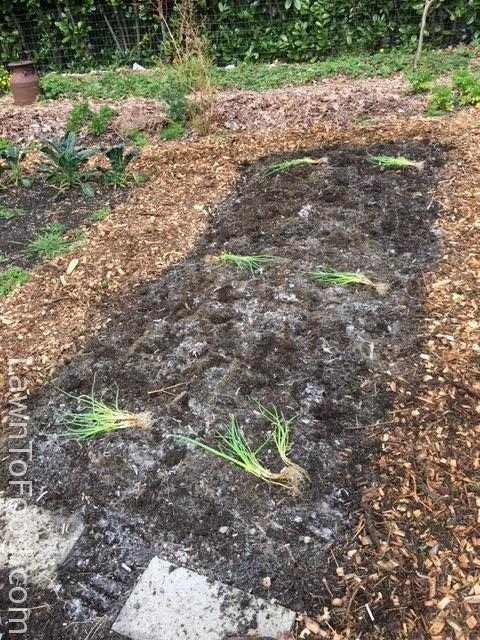 I planted each onion about 6″-8″ apart from its neighbour in a staggered fashion, rather than rows. Now that the onions are planted in their blocks, I can set in the 6 kale seedlings. The kale will grow quite large so they will need all of the space left in this plot. I know that the Red Russian variety will be the tallest so I put it in the middle, then a Lacianto kale to the left and a Green Curly kale to the right. 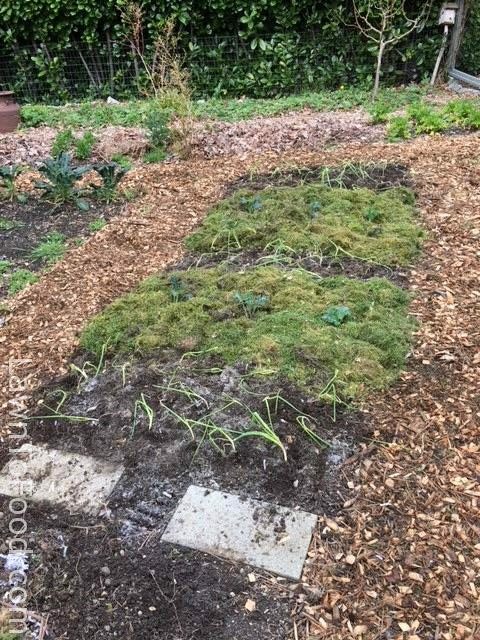 To finish my episode in the garden, I mulched around the 6 kale plants with a generous blanket of freshly mowed grass clippings. The fresh grass was already heating up with compost action! Those grass clippings will help warm the surrounding soil, prevent new weeds from popping up in the spring sunshine and add nitrogen to the soil as it decomposes. Short and sweet! My task is complete! 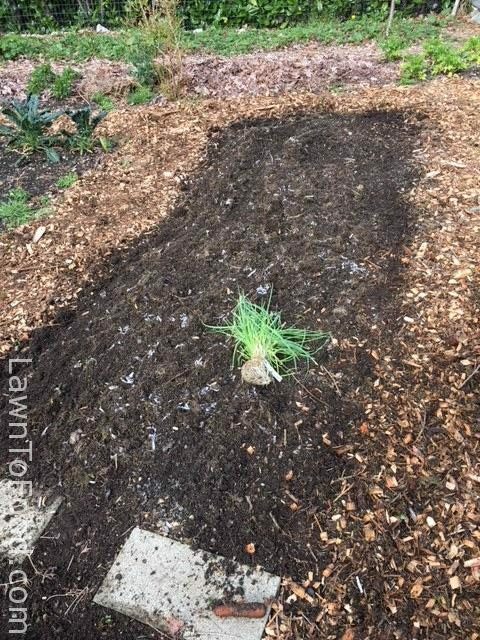 This entry was posted in Compost & Soil Condition, Crop Planning, Growing Food, Weeds & Mulch by Lynda. Bookmark the permalink.